There's no need to hit the beach to catch the perfect waves. E! 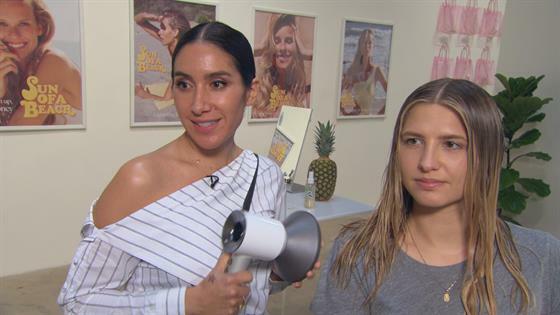 News caught up with celebrity hairstylist Jen Atkin—you've undoubtedly seen her work on the Kardashians, Bella and Gigi Hadid and Kaia Gerber—to give us that yacht-riding, ombre look…without paying the big bucks Chrissy Teigen may shell out for lighter, effortless-looking tresses. First, start with clean, towel-dried, damp hair. Then apply Sun of Beach Ombré Spray, the latest launch from the Ouai founder's hair collection, from mid strand to the ends. "You want to make sure you don't spray directly at the root because—no one knows this— but when you get your hair color done, the heat from your scalp actually lifts faster than your mid-length does," noted the pro. Next, use a diffuser to heat the hair. In a few days, you should see your hair go two to four shades lighter. "It'll get you through ‘til your next highlight appointment," said Jen. For the girl who needs immediate results, the stylist suggested using a texture mist, like Wave Spray, to create girl-on-the-go beach waves. "I like to take one-inch sections, start from the bottom, leave the end out, and just bend the hair back and forth, kind of like an accordion, and just place it gently in the diffuser. The end result: sun-kissed, effortless waves—no curling iron or hours in the sun needed! Ouai Sun of Beach is available at Sephora and theouai.com.